Most of Oswald Chambers’ books weren’t originally in book form, but were given as lectures or sermons which were recorded in shorthand by his wife. Shade Of His Hand contains the last messages given by Oswald Chambers before his death. It’s a series of lectures on each chapter of the book of Ecclesiastes. For many people (even seasoned Christians) the message in Ecclesiastes in a challenging one. Solomon is the wisest man who ever lived, yet in this book of the Bible he records his observations of the world in what seems to be a very “non-Christian” (to use a New Testament term) sort of way. Then along comes Oswald Chambers with insight into this book unlike anything you’ve seen before! Indeed, Chambers doesn’t flinch one bit in addressing the complex issues Solomon brings up, and he does so in a way that is easy to grasp for all of us. I read each chapter of Ecclesiastes before each chapter in this book, and then I re-read the same chapter in Ecclesiastes again afterwards. Wow, what a transformation in my understanding of the biblical text! 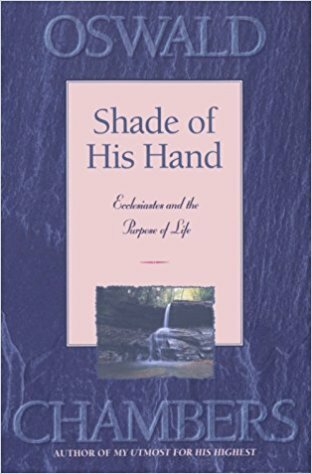 If you would like to gain some life-changing insight on this valuable book of biblical wisdom, I urge you to check out Shade Of His Hand.